Naomi Osaka Historic U.S. Open Win Marred By Serena Williams Controversies Around Code Violations & $17,000 Fine For Them. (CNN)The US Open has fined Serena Williams $17,000 for three code violations during her loss in Saturday’s women’s singles final, the United States Tennis Association said. 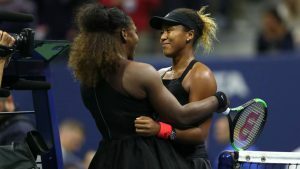 Saturday’s match between Williams and Naomi Osaka in New York’s Arthur Ashe Stadium was marred by controversy in the second set after umpire Carlos Ramos penalized Williams a point and then an entire game. Osaka beat Williams in straight sets — 6-2, 6-4 — to win her first Grand Slam title. The 23-time Grand Slam champ didn’t elaborate on the previous incidents, but in 2009 she was docked a point after she was deemed verbally abusive to a lineswoman. In 2011, Williams’ opponent Sam Stosur was awarded a key point, and thus the game, when an umpire ruled Williams yelling, “Come on,” had hindered Stosur before she made contact with the ball. Later in Saturday’s match, Ramos docked Williams a point after she smashed her racket upon misplaying a shot. Ramos then issued Williams a full game penalty after she called him a “thief,” saying the comment amounted to verbal abuse. “You stole a point from me, and you are a thief,” Williams told him. It was a case she also was heard making to tournament referee Brian Earley and supervisor Donna Kelso, who Williams summoned to the court after Ramos penalized her. Catsuit ban: What does it say about us? 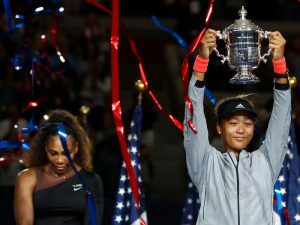 The controversy dampened Osaka’s victory, the first for a Japanese player, but Williams was quick to say during the post-match trophy presentation that her opponent deserved the win. Chair umpires typically receive gifts during trophy presentations, but Ramos was notably absent for the ceremony. Earley, the tournament referee, levied fines against Williams of $4,000 for the coaching violation, $3,000 for racket abuse and $10,000 for the verbal abuse, the USTA said. The money will go to the International Tennis Federation’s Grand Slam Development Fund. Williams won $1.85 million as a US Open finalist.